The son of a Swedish Actor-Comedian, Producer, Director and Musician; music and the arts were a natural part of Yan Birch’s life, surrounding him throughout his early childhood. He learned to play the flute and trumpet at a tender age, and his passion for acting led him to the stage as a young child, appearing in several plays, including “Miss Julie”, by August Strindberg. Yan’s early television career in Sweden included two successful youth programs “Barnjournalen”, a popular weekly kid’s show, and “Unga Tvaan”, at that time Sweden’s MTV equivalent. Yan also had a band and released several successful recordings which received much radio airplay. Graduating with a BA in Mechanical Engineering and a degree in Mathematics, Yan completed his studies from the technical college Teknikum in Vaxjo, Sweden. At this point in his life, Yan decided to have a dramatic “Life Learning Experience.” He traveled the world and lived in almost every country before making the big Hollywood move to live out his dream. He took nothing with him but the determination to “Experience” people from all over the world so that he would be well prepared for Hollywood and whatever was to come his way. With talent, experience, unending support from his family, and maybe a little genetic determination to perform, Yan swiftly obtained acting parts in music videos and commercials, working with people like Billy Idol, David Fincher, Mark Rezyka and Mickey Rourke before landing his first American feature roles in Slumber Party Massacre III (1990), and The Runestone (1991). From these, he was flown to Italy where he landed a starring role in the feature film “Scrondo” and several other Italian television shows. 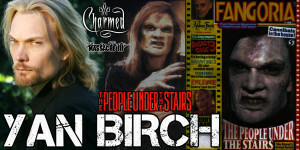 In 1991, Yan got a major part in Wes Craven’s cult horror film The People Under the Stairs (1991), as “The Stairmaster.” While his love for the fun of working on Horror and Science Fiction films took him on a road through the underground, his acting ability landed him the steadier roles in two popular network daytime soaps “Santa Barbara” (1984) and “The Young and the Restless” (1973). Yan capitalized on his Swedish good looks, and his menacing appearance, playing both a sensitive health club owner and a mobster, while working to better his craft in this different media. After working on a few more Indy films like Cyber Bandits (1995) together with Grace Jones, Alexandra Paul, Martin Kemp and Adam Ant, helmed by Erik Fleming and Sucker: The Vampire (1998) (V) written and directed by Hans Rodionoff, in 1999 Yan received a phone call from Chuck Russell and was offered the role of the “Guardian Angel” in Paramount’s Bless the Child (2000). Directed by Chuck Russell and starring Kim Basinger, Jimmy Smits, Christina Ricci and Rufus Sewell. Since then, Yan has appeared in several more independent films including Essence of Echoes (2002) and Ghost Rock (2003). Yan also has a recurring role on Spelling television’s hit series “Charmed” (1998) on WB, as “Kane” – the head of the Warlocks. Yan has also starred in a multitude of television commercials during the years working with Directors such as Mark Pellington, David LaChapelle, Jake Scott, Ralf Schmerberg, Pierre Winther, Albert Watson, ‘Regis Roinsard’ , Paul Minor and Paul Hunter.